Needless to say, we are very proud of the June 17th edition! Sooner or later, we all have to buy a new mattress. The choices are confusing: pillow top or cushion firm, springs or foam? Being a discriminating shopper means climbing into the sack in the middle of a crowded store while pushy salespeople hover. You make a choice after that brief encounter, and you have to sleep with it for years. At least there’s been one comfortingly simple rule: the firmer the mattress, the better for your back. OR MAYBE NOT. While this axiom is widely held, it turns out there isn’t scientific evidence to back it up. The conventional wisdom on firmness derives from the days when a good bed was a luxury. “Physicians used to advise people to put a board under the mattress to keep it from sagging,” says Dr. Richard Deyo, a back-pain expert at the University of Washington. In fact, experts say the ideal bunk is not a hard one or a soft one—but a comfy one. It turns out Goldilocks was correct not to sleep in either the Papa Bear’s or Mama Bear’s bed. So how can you improve your chances of finding that bliss? Americans typically buy a new bed every 10 years. But don’t go by the numbers—listen to your body. 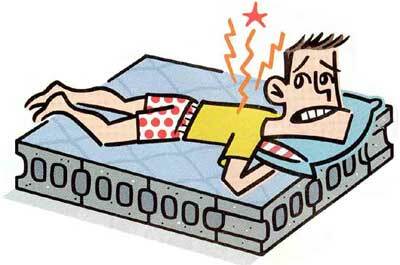 Do you wake up stiff, sore or unrested? If you ache in the morning—not just after holding yourself upright all day—your bed may be at fault. An uncomfortable mattress can also keep you active during the night, leaving you weary during the day. How can you ensure that your new mattress is better than your old one? Begin by abandoning the firmness doctrine. The ideal mattress yields to your contours. But not too much. Side and stomach sleepers tend to need more give than back sleepers. And a woman’s hips will need to sink deeper than a man’s. guarantee. That’s why you should buy with the option to return or exchange—sleep shops like 1-800-MATTRESS and Mattress Discounters (1-800-BUY-A-BED) allow exchanges within 30 or 60 days. Better yet, find a mattress you can adjust to the point of perfection. Flobeds (flobeds.com or 1-800-FLOBEDS) sells stackable latex panels that range from soft to superfirm. Stack two panels of different firmness for a truly customized sleep. And because each side of the mattress has separate panels, your partner can sleep on marble while you float on marshmallows.